New pianos are tuned to A440 and this is the standard so that all instruments can play together and be on the same note or in tune together. Some pianos when they are built have a string breaking strain of within 10%. This means that if the string is pulled higher than 10% over pitch it will break. We need to over pull the string when tuning to get it to hold on pitch. So sometimes we tuner’s walk a tight rope hoping strings won’t break when being tuned. Pianos over time drop pitch. They do this to achieve the best tone. As the piano gets older and it’s not tuned regularly the pitch will drop. Sometimes about 2 cents a year. Pitch is measured in cents. There is 100 cents between each note on a piano. So if Gary says the piano is 50 cents flat that means the piano is 1/4 of a tone flat. Or half of one note. Now tuning doesn’t automatically mean the piano is tuned to pitch. A piano can be tuned below pitch and still sound nice. It just means you can’t play it with other instruments tuned to pitch. Gary always recommends that someone learning to play piano should learn on a piano on pitch. When Gary comes across a Piano that is below pitch he always talks to the customer about pulling it up to pitch and the extra costs involved. In most cases, the piano would just need a “pull-up”, which at Piano Magic costs $165 on top of the tune. The reason for this is because the piano needs to be tuned twice. It can be done straight away, and Gary uses an app that has a pitch raise mode that measures each note before tuning and calculates the correct amount of over pull so when the pitch raise is done the piano is close to pitch. Problems when the piano is built with a string breaking strain close to pitch. As the piano gets older the strings lose there resilience and will break at a lower tension. We have to be very careful when pulling some pianos up to pitch. Typical problem pianos are Grey frame Wertheim, Fritz Kula, small Alex Steinbach, Ed Seiler and Conober Cable. All these pianos can be tuned to pitch if the strings are replaced. The cost is generally quite high. There are 215 strings in a piano and it will need tuning 5 times after the string replacement to get it to hold, followed by a tuning each 6 months for about 2 years. Checking pitch on your old/ new piano. If you have an old piano given to you the chances are it won’t be on pitch. It is easy to check if you’re organised when looking at the piano before you buy. Rule number one. Don’t get the piano teacher to check the piano for you. It is like getting the driving instructor to buy a car for you! Talk to Gary or a Piano Tuner that is ARPT registered. How do you check the pitch? Find a small keyboard and play the C on the keyboard as you play the C on the piano. If they sound the same you are good to go – otherwise, there are plenty of pitch checking applications for mobiles, and even sites you can go to! Happy playing. Enjoy your piano. 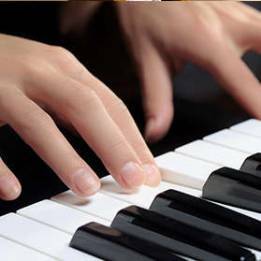 For more information on our piano tuning service head to our Piano Tuning Page. Want to learn more about tuning? Learn more on our blog.